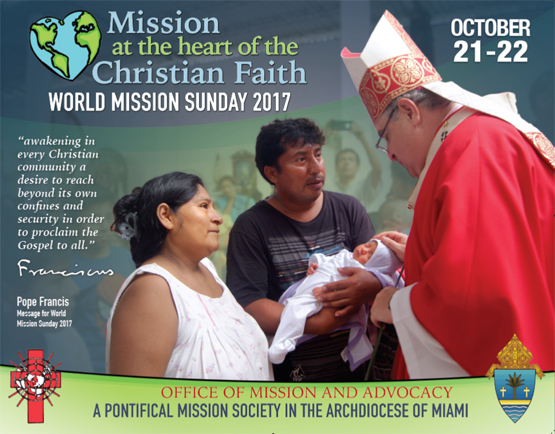 World Mission Sunday, organized by the Propagation of the Faith, is a day set aside for Catholics worldwide to recommit themselves to the Church's missionary activity through prayer and sacrifice. Offerings collected every year from Catholics in the United States, on World Mission Sunday, are combined with offerings to the Propagation of the Faith worldwide to serve the needs of the Catholic Church in the Missions. The World Mission Sunday is a time for each of us to remember and reflect upon our own baptismal call to mission and how we can live that in our daily lives, while we join is support of the urgent needs in the global mission. We can arrange for a guest speaker, materials and ideas to help promote World Mission Sunday in your parish, classroom or ministry. Call the Mission Office today!